Night has already parceled the wall into disconnected bricks. and burned them in effigy. In silence the sky responds. have returned home to a different kind of wailing. The soldiers have already said goodbye to their limbs. have retired their chessboards and stories and ancestors. There is nothing left to lose and ask for again. down past the river, through the sands, to this myth. I am wanting to be rid of your bricks and light: my religion. But the ears of the wall have closed for the night. At night the river runs backwards, toward memory and truth. until love has left me so love can return. John Sibley Williams is the author of Controlled Hallucinations (FutureCycle Press, 2013) and six poetry chapbooks. He is the winner of the HEART Poetry Award, and finalist for the Pushcart, Rumi, and The Pinch Poetry Prizes. 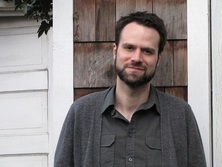 John serves as editor of The Inflectionist Review, co-director of the Walt Whitman 150 project, and Marketing Director of Inkwater Press. A few previous publishing credits include: Third Coast, Inkwell, Cider Press Review, Bryant Literary Review, Cream City Review, The Chaffin Journal, The Evansville Review, RHINO, and various anthologies. He lives in Portland, Oregon.